Roy Hodgson could be on his way back to Inter Milan. The Serie A champions would like the English coach to take charge of Inter's international relations, the Gazzetta dello Sport reported Tuesday. 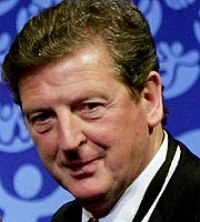 Hodgson is currently the coach of Finland, which is tied for second in Group A of 2008 European Championship qualifying. Inter reportedly wants Hodgson to come to Milan if Finland fails to qualify. Hodgson coached Inter from 1995-97 and briefly in 1999. He led the club to the 1997 UEFA Cup final, which Inter lost to Schalke on penalties. Hodgson was part of FIFA's technical study group during last year's World Cup in Germany and has served in the same capacity for UEFA during several European Championships. He would oversee relations with FIFA and UEFA at Inter. Inter's top goal this season is winning the Champions League, which is organized by UEFA.